Developmentally appropriate practice, often shortened to DAP, is an approach to teaching grounded both in the research on how young children develop and learn and in what is known about effective early education. DAP – wherein teachers and staff base all practices and decisions with the goal of nurturing students’ social/emotional, physical, and cognitive development – is a keystone for the establishment of safe supportive learning environments for young children. All domains of development – cognitive, physical, social and emotional – are inter-related, and experiences in one domain influence development in others. DAP entails planning and delivering educational content and supports that cut across all domains of development, ranging from cognitive skills and executive function to social-emotional and problem solving skills. Children’s early social experiences foster confidence and skills that support the development of relationships with both adults and peers in subsequent years; these experiences further enhance the child’s social competence and academic achievement. Similarly, the failure to develop basic social skills means children may be rejected by their peers, and are more likely to experience negative outcomes such as school dropout, delin­quency, and mental health problems. DAP is synonymous with positive school climate – both offer young learners positive relationships and emotional and physical safety at school. Very young children will thrive and become more engaged learners when provided a safe, stimulating environment, where adults provide and foster positive relationships between and among adults and children. All students – and particularly young children – learn best when their education is provided in an environment that is safe both physically and emotionally. Physical safety includes the protection of students from violence, or from exposure to weapons, threats, or illegal substances on school grounds. Emotional safety includes opportunities for children to express a range of feelings and behaviors and receive appropriate guidance and supports to learn social skills and self-management. By providing a safe, supportive environment, student’s basic needs for belonging, autonomy, influence, and competence can be fulfilled. DAP, like the concept of “safe supportive learning,” is not an “add on” curriculum – it’s an approach. In its simplest form, DAP requires an understanding of child development and thoughtful planning; it does not require a specific program or curriculum. DAP is an approach where school personnel demonstrate responsiveness to individual children’s abilities, behavior, culture, and language in their planning and decision making. Providing DAP helps build a positive school and classroom climate, strengthens partnerships with families, ensures that each child is seen for their unique potential, and lays the foundation for increasing the academic achievement of all children. Reviews four key categories of data collected in early childhood settings, clarifies the information each provides, and illustrates how the data are meant to be used to improve practice and quality. 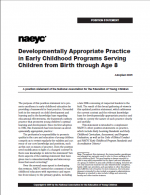 Outlines position statement of the National Association for the Education of Young Children. Includes literature, guidelines, and recommendations for creating developmentally appropriate practices targeted to this age group. Self-regulation in young children predicts their later functioning in areas such as problem solving, planning, focused attention, and metacognition, and thus contributes to their success as learners.